Click here to book your next adventure! Immerse yourself in the rhythm of the sea while learning to paddle in varying conditions. Spend your days exploring inner coves and islands of the Maine Coast while observing wildlife above and below the water. In the evening enjoy sunsets, the brilliance of the evening stars and the bioluminescence of the bay from your island campsite. 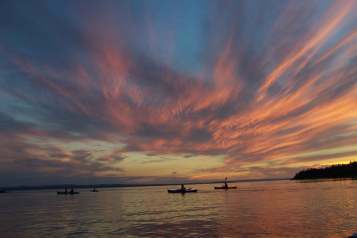 Our Professional Maine Guides will customize a trip that meets your expectations. All necessary kayak equipment and meals provided. Participants provide camping gear or gear rentals are available. Guided by Registered Maine Guides and ACA Instructors. Customized Camping Adventures specifically for Your Group: Camps, Clubs, Families, Friends! Interested in enhancing your skills during the trip? 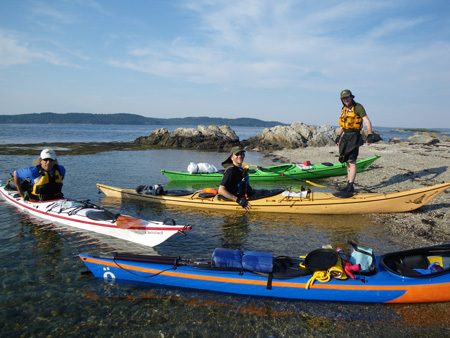 We can include customized instruction on a variety of topics including camping skills, navigation practice, rescue skills, tides currents etc.....to help the group become more independent paddlers. Perseid Meteor Showers mid August! 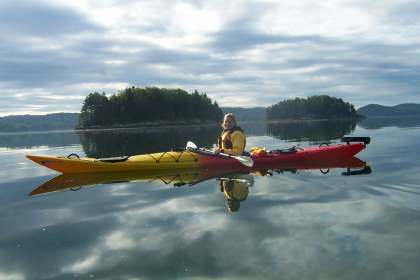 Sea Kayak where whales migrate passing between two nations, Canada and the United States. 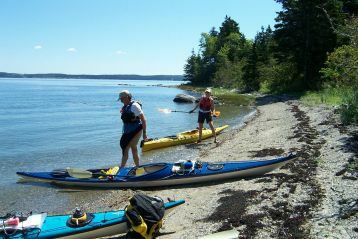 We’ll spend two full days kayaking exploring the dynamic coastline of Campobello Island, stepping back in time among the surrounding islands where the art of weir fishing is still practiced and where 20 foot tides expose a unique intertidal zone and produce amazing currents. Whales follow the flow of food through the “feeding grounds” as the locals call it, just off the beautiful Campobello Lighthouse. Stay longer and take time to visit Roosevelt’s Estate and gardens by bicycle along the quiet roadways through the island. To learn more about the trip, click here! This journey takes us into the open water across Penobscot Bay for a unique coastal experience. There are amazing glacial formations, beautiful cliffs, bays and summer homes. The camping at Warren Island state park is posh but secluded, with outhouses, firewood, fresh water and trails. We sometimes stop along the way at a more remote island for camping too! After a long day’s paddle on day one, day two allows for time to explore the island and paddle around Seven Hundred Acre Island and if weather and ambition allows, explore the islands to the south of Warren. There is a marina and general store nearby on Seven Hundred Acre island that has showers if anyone is so inclined!